Len Outzs (bottom center in first photo) is the person you want to contact if you want to play pickleball. He the one who sends all those pickleball e-mails about pickleball schedules and pickleball events. It was Len who contacted ambassadors Rich and Donna Donald to make arrangements for a pickleball clinic for the SummerGlen players. SummerGlen is a gated, active adult community of about 1000 individual family homes, located in Ocala, Fl. According to Florida Leisure Communities it's where country charm meets city convenience. 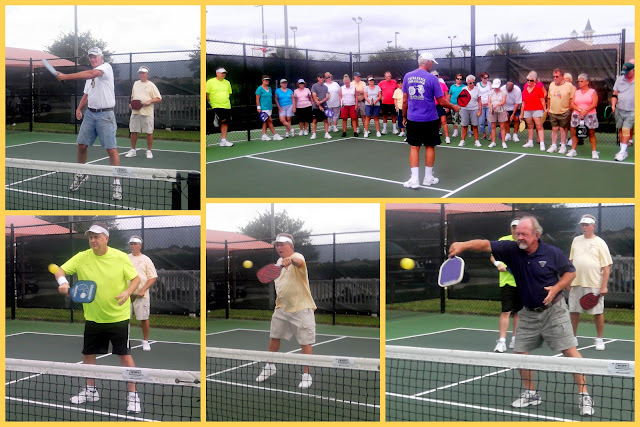 On September 9th, about 35 players, from beginner to experienced attended a pickleball skills/techniques clinic. Rich Donald talked about and demonstrated ways to help players improve their play, including safety, the proper grip, court awareness, the serve, ground strokes, volleys, lobs, the soft game the third shot and more.......... Four experienced players from the group assisted Rich with demonstrations, and lots of great questions came from the group. There is always so much covered in a clinic - it's sometimes hard to remember all those great pointers. So several of the players took advantage of taking home one of Coach Mo's 21 Skills Video that Rich and Donna had brought with them. The weather was threatening - but Len assured everyone that we would not get rain.... he was right; Many of the players stayed to play and practice what they learned......Below the SummerGlen player along with instructor, Rich Donald (far left) pose for the group picture!